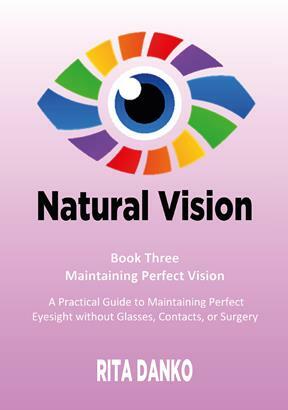 MY PASSION FOR teaching Natural Vision and empowering others in their quest for better eyesight without glasses, contacts or Lasik surgery has prompted me to write a series of DIY books. Since I threw my own glasses away in 1991 I know that glasses are an unnecessary crutch and it is in everyone’s power to give them up because nature has given us this fantastic ability to heal ourselves and I aim to help, inform and encourage you with my life experience teaching so that you too can have perfect eyesight without them. Natural Vision teacher from the Janet Goodrich School of Natural Vision Improvement Queensland Australia RITA REET DANKO was born in Tallinn, Estonia and left with her mother at the outbreak of World War 2 to Austria where she started primary school in Vienna. She arrived in Australia in 1950 with her Mother as a World War II refugee and continued schooling in Benalla, then Melbourne. She studied Natural Vision with Dr. Janet Goodrich in 1993 and since throwing her own glasses away, has been teaching Natural Vision at Melbourne Monash University, Swinburne college, Council for Adult Education and U3A. Rita believes that our body is a self-healing organ and since eyes are part of the body then they should also be able to heal themselves. This booklet aims to encourage and empower the reader to do the simple exercises and maintain healthy eyes for life. Published by Rita Danko, Author can be contacted on email: ardanko02@hotmail.com.